WAVEART is a concept event that will bring electronic music in concert. Plaid is a London-based British electronic music duo comprising Andy Turner and Ed Handley whose sound is characterized by many reviewers as post-techno. They were founding members of The Black Dog and used many other names, such as Atypic (Andy Turner) and Balil (Ed Handley), before settling on Plaid. They have collaborated with female singers Mara Carlyle,Nicolette and Björk, and have released records on the labels Clear, Peacefrog, Black Dog Productions, and Warp Records (along with Trent Reznor's label Nothing Records). Started in 1997 as a hobby, BRAZDA LUI NOVAC is now Romanian musician Victor Popescu’s electronic music project. Having spent his childhood in a district called „Brazda Lui Novac” (tr. „the furrow of Novac”), Victor found it fitting to give the same name to what he musically creates now. BRAZDA LUI NOVAC’s sound stretches from melodic synth lines with complex beats to collages of industrial and electro, sometimes encompassing subtle elements of shoegaze. 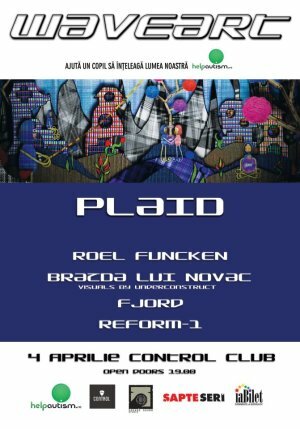 "WAVEART #1 - PLAID, ROEL FUNCKEN, BRAZDA LUI NOVAC, FJORD, REFORM-1" Concert in Bucharest. You can get here description, reviews, address, time and details of "WAVEART #1 - PLAID, ROEL FUNCKEN, BRAZDA LUI NOVAC, FJORD, REFORM-1" Concert in Bucharest. Visit Bucharest Tips for more Concert events in Bucharest!